If you looked at the test mule above and went, “Oh, that’s just another Porsche 911,” then you’d be right. 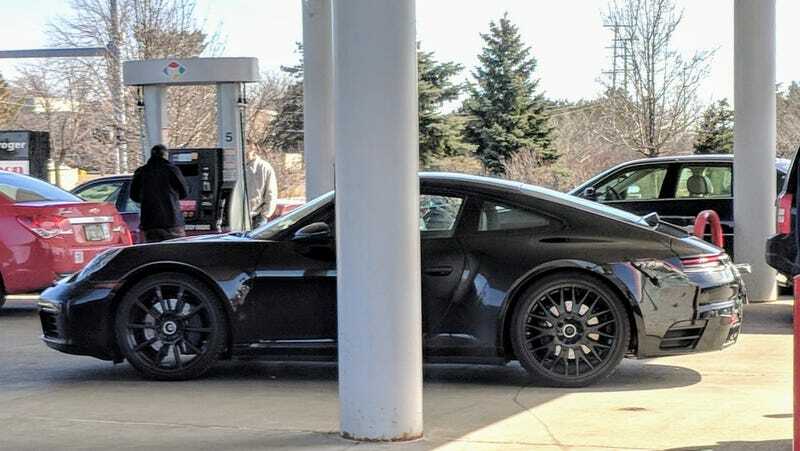 It definitely is another Porsche 911, but it’s also probably the new 992-generation 911. An eagle-eyed reader named Jamie spotted this mule at a gas station in Ann Arbor over the weekend. It was wearing manufacturer plates and had the single, unbroken light bar across its tail that we’re pretty sure the 992 911s will wear. Obviously, because it’s a 911, it won’t look too different from the outgoing 991.2 generation. Flat-six in the back, round headlights, blah blah blah. There are a few universal constants we can rely on and a 911's looks is one of them. The engine is what could undergo the biggest change of all. Back in February, 911 model line director August Achleitner hinted that an electric 911 could appear somewhere down the line, most likely in the 992 generation. That would be wild! Would anyone buy it? Or would the purists merely yell about it on the internet? Anyway, whatever Porsche decides to do, at least the 911 will still look like a 911.